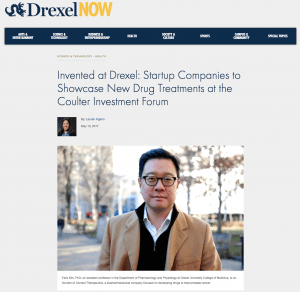 The companies — Context Therapeutics, Kerberos Biopharma and PolyCore Therapeutics — each were supported with funding from the Coulter-Drexel Translational Research Partnership Program, which provides both grants and guidance for academics to commercialize inventions. Now the startups have the opportunity to vie for the attention of venture capitalists and technology transfer professionals during the Coulter Investment Forum on May 16 and 17, in Ann Arbor, Mich.
At Drexel, the program, which is endowed by the Wallace H. Coulter Foundation, has awarded $7.6 million to 50 projects since its inception 11 years ago. Formatted like the popular reality television show “Shark Tank,” faculty members submit applications to an oversight committee at the university and advance to other rounds, where they are grilled with questions ranging from regulatory requirements to reimbursement strategies. “Coulter challenged us to find ways to address the problems of entering a market that might be quite resistant to the problem we are trying to solve,” said Alessandro Fatatis, MD,PhD, a professor in the College of Medicine, and chief scientific officer at Kerberos.